Product Description: The Amprobe TMA20HW Hot Wire anemometer technology eliminates the use of bearings and rotating parts. 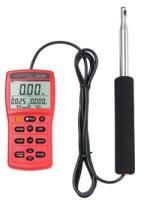 Because of this fact the meter is durable and provides good and stable accuracy of the measurements. It is used for indoor air quality and HVAC/R technicians measuring heating, ventilation, air-conditioning, refrigeration, wind flow and temperature in residential, commercial and industrial air conditioning systems.